Resources for helping students plan projects through setting goals and objectives, and using the 4 T’s (Task, Time, Team, and Tools). A single sheet that guides students through the planning process. By completing the sheet, students can develop a plan for any project. Resources collected by Sarah Maxwell, Skillin Assistant Superintendent, and Skillin staff around developing a classroom culture that supports risk taking, making mistakes, and fosters high levels of student engagement is ongoing, intentional work. Perfect for Grades 3-5, a goal setting activity for short term goal setting with partners. The Middle Web provides 7 strategies for helping students self assess and reflect. 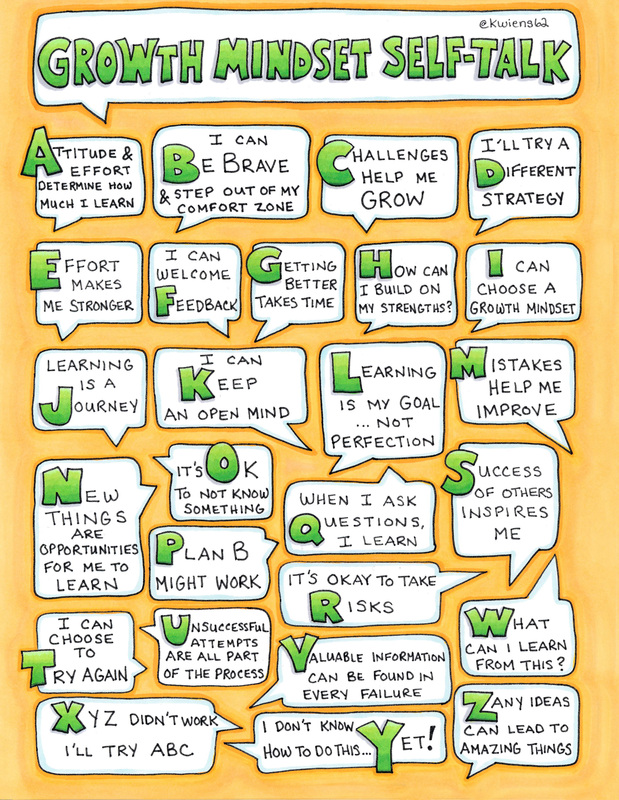 A graphic to post in your classroom or use with students to encourage growth mindset talk. This article provides concrete strategies for teachers of reading and language arts using the roles of miner, mirror, model and mentor. (11:30) The Learning Pit is a celebrated way to help develop challenge, resilience and a Growth Mindset. This animation helps to explain exactly how to use it with your students. The five-episode video series (along with a few incredible activities) highlight the power of having a growth mindset, and how any student can learn this skill! Gates Foundation (3:41): Students of all ages talk about their goals. Video demonstrating how to facilitate I Noticed and I Wondered feedback strategies. (2:05): Setting short term goals with students in math and literacy. Help students gain the ability to create and execute a plan. Teach them how to set a goal, list tasks to achieve the goal, assign time to complete each task, and gather teams and tools to help. An unamed girl has a wonderful idea. She is going to make the most MAGNIFICENT thing! But making her magnificent thing is anything but easy, and the girl tries and fails, repeatedly. Eventually, the girl gets really, really mad. She is so mad, in fact, that she quits. But after her dog convinces her to take a walk, she comes back to her project with renewed enthusiasm and manages to get it just right. It's OK to make a mistake. In fact, hooray for mistakes! A mistake is an adventure in creativity, a portal of discovery. As a child, Michael Jordan almost gave up on his hoop dreams, all because he feared he'd never grow tall enough to play the game that would one day make him famous. That's when his mother and father stepped in and shared the invaluable lesson of what really goes into the making of a champion -- patience, determination, and hard work. A story of a child who isn't sure what to make of a chance encounter, then discovers that when you get brave, take chances, and say yes to new experiences, amazing things can happen. Perfect for teaching risk-taking. This is the story of one brilliant idea and the child who helps to bring it into the world. As the child's confidence grows, so does the idea itself. Being perfect is overrated. Beatrice Bottomwell has NEVER (not once!) made a mistake. One day, the inevitable happens: Beatrice makes a huge mistake in front of everyone! But in the end, readers (and perfectionists) will realize that life is more fun when you enjoy everything--even the mistakes.